A couple of us met up and had a tasting of several nice wines. We started with this Pinot Noir, building our way up to the Bordeaux by way of some Portuguese, South African and Spanish bottles. Read on for the highlights! Gorgeous purple- see through but clear. The nose is heavy on the strawberry. Nutmeg is present, spice box and vanilla bean round it out. On the palate it is lush, light and layered. Strawberry coulis mixed with cedar plank and cherry abound. The mid palate exhibits a darker fruit component and more spices that I found on the nose. The wine has a very nice acidity and the very lithe tannins only show up at the finale. An excellent bottle that drinks beautifully now and will go on for another 5/7 years. 91 points for this Pinot and 5 stars. It is a perennial favorite of mine and is consistent, year in and year out. $20. Salut…. I love this wine, so every time I see a bottle, it’s in the bag. This latest vintage is no exception. I forgot to take a picture so have had to use a stock photo. Dark purple, nearly see-through. Nose is gorgeous, a mix of strawberry, cherry and the key component….vanilla cherry cola. The palate is amazing- black cherries, strawberry pie and super smooth acidity. There are just a hint of tannins, perfect for a Pinot Noir. This wine is 100% New World, totally awesome and necessary for any cellar. This is a spectacular wine that gets 93 points from me and 5 stars. If you can find it, buy it. My sources are coming up at $25. Drink this wine all by itself to truly appreciate its nuances, or if you must pair it- Lamb chops, Venison, Steak au Poivre. Salut…. A cross between Old World elegance and New World charm for this delicious Pinot Noir. I have had some really good wine from the Marlborough region of New Zealand lately and this is no exception. Pale in color as a Pinot should be, the nose was very bright with cherry and strawberry notes. Old world funk on the palate with bright fruit made for an interesting taste profile. Cherry spritz comes to mind with some green peppers mingling about. Hints of strawberry daiquiri and some cedar came through on the back end and the acidity was great. This was a very interesting wine and we thoroughly enjoyed it with some Pate and cheeses. I would also pair it with Turkey and cranberry sauce. $20 and 90 points make this an outstanding 5 star wine for me. Ps. I love the label, very classy. Salut…. I have had the 2005 Close Du Marquis, twice. This vintage is not as solid and lacks depth. My Danish buddy brought it to our tasting and we saved it for the finale. Unfortunately, the best was not saved for last- the best was the Pioneer Pinot that we tasted first. Very dark and opaque in the glass. The nose resonates with plums, Kirsch and Pepsi cola. The palate has a definitive edge- plums, gripping tannins, acidity and pencil lead. Cassis appears on the mid with a blue fruit and cedar component. The finish is somewhat short, but pleasant with kirsch and cassis dominating while the tannins recede. 89 points and for $55, 3 stars. Salut…. It is difficult for me to pick my top 20 of the year, I have had the opportunity to taste so many wonderful wines and more importantly- to share them with family and friends. This year, I started adding the price onto each blog post so you could better understand how I rate the wines. The value of a wine is a balance of it’s technical merits versus the price paid. For 2013, I looked at all the 5 star wines and decided from that list which ones were the standouts. I included my personal experiences in the decision when choosing the top. In my list are 5 whites (one sparkler), 3 from my state of Virginia, 3 from France, a South African and a smattering of Australian and Kiwi wines as well as the American contingency. 20. The Clos Du Bois Chardonnay Calcaire from the 2010 vintage was an amazing, crisp white that I gave 91 points to. 19. Trivento’s Amado Sur was a unique blend of Malbec, Bonarda and Syrah. Available locally for about $15 it is sure to please. 18. From Virginia comes the Barboursville Chardonnay, which I re-tasted last year. I also wrote about the winery visit, a great day out if you happen to be in the middle of Virginia. 17. From Bordeaux comes the Virginie Thunevin from the amazing 2009 vintage. Priced right, it offers up everything a claret should be. 16. The only one of it’s varietal, the Van Ruiten Zin was a delicious California gem that I have been on the lookout for. 15. The Parsons Flat Shiraz from Henry’s Drive was an amazing Cabernet made more special because it was brought to the table by my friend ‘The Beave’ whom I shared 6 weeks of training with over Thanksgiving, Christmas and New Year. 14. First Drop ‘Mother’s Milk’ was probably one of the smoothest Shiraz’s I have tasted. A delicious, yet complex wine with an amazing label. 13. A delicious Napa Cab from Burgess Cellars slips into lucky 13 with it’s 2002 vintage. A seasoned, mellow and nuanced offering that hits it just right for me. 12. Mollydooker’s Two Left Feet was an impressive wine that I experimented using the ‘Mollydooker Shake’ to open the wine up. 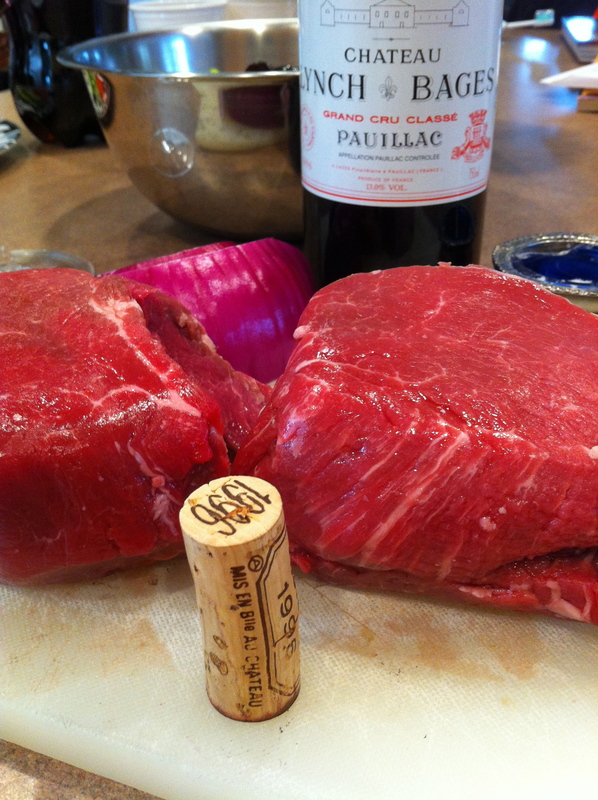 Very approachable and delicious, it screams for a grill and some good times! 11. From California came the Carpe Diem 2009 that Moxie and I drank on our trip to Napa. A great wine and an amazing visit to the west coast enroute to Bali. 10. Vergelegen is the South African wine that made my list. This claret styled wine was spectacular for an amazing price. 9. Another stunner from Mollydooker, ‘The Scooter 2010’ was an approachable and fun wine that I could drink all the time. Easygoing and smooth for a decent price. 7. The other Pinot on my list also hails from New Zealand. 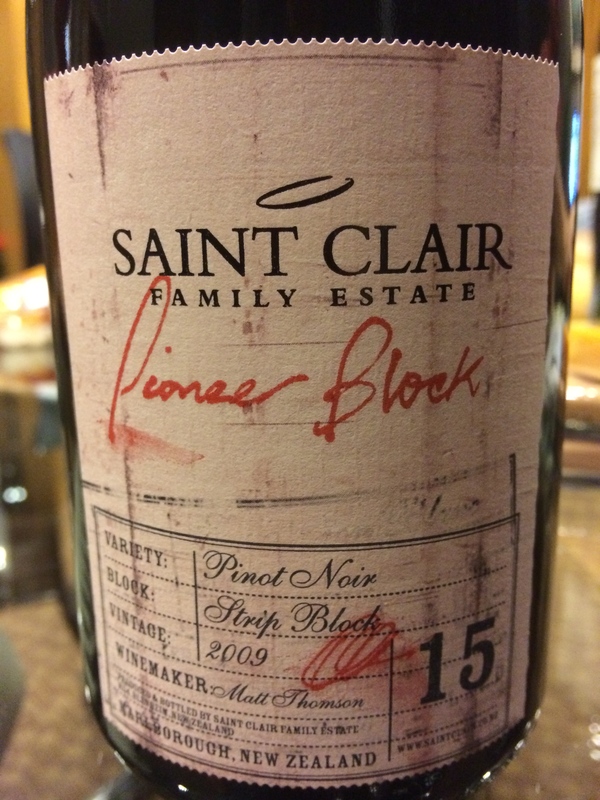 The Saint Clair Block 15 was an astounding wine that managed to balance old world and new in a delicious package that had me reeling for more. 6. The third white in the lineup comes from Barboursville as well. The Malvaxia is tied for my highest scoring wine with 96 points. A stunner that needs to be beholden. I was speechless after drinking it. 5. When Moxie and I visited Napa, we stopped at the Cosentino winery where I picked up the Poet 2009. Apart form the huge 94 points I gave it, there was something special about the whole winery experience and the bottle itself. 4. Bella’s Garden 2010 would have gotten 6 stars if I my scale went that high. This offering form Two Hands was sublime, a wine drinker’s paradise in a glass. 3. The last of the whites is another from Barboursvile in Virginia that would also have gotten 6 stars if allowed. The 94 point, $16 Non-Vintage Phileo was a show stopping wine that makes me realize how lucky I am to have discovered this winery. This is a bucket list wine folks. 2. There is no doubt that Dom Perignon is one of the Kings of Champagne. Served at my parents 50th anniversary made it all the more special, delicious and memorable. At 95 points, the price did not matter. This wine oozed class and was savored by the whole family. 1. 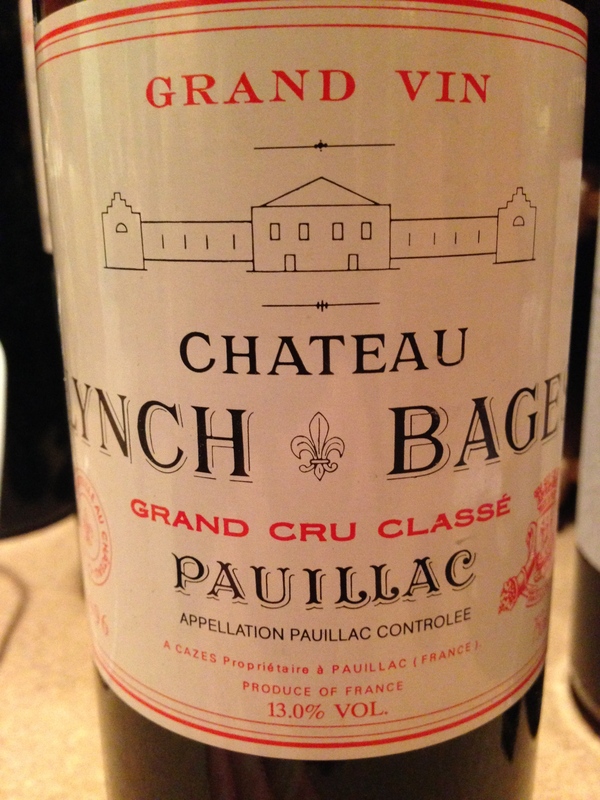 I have written about Lynch Bages on many occasions so it should not be a surprise that my last two bottles of the 1996 vintage made me award them the #1 spot. The first bottle was opened on my birthday, I gave it 95 points. The final bottle was opened in November with our best friends, it got 94 points. Wine is for sharing, for the memories and for our enjoyment. I hope you have the opportunity to try at least one of my top 20. Happy New Year and the best success for 2014.